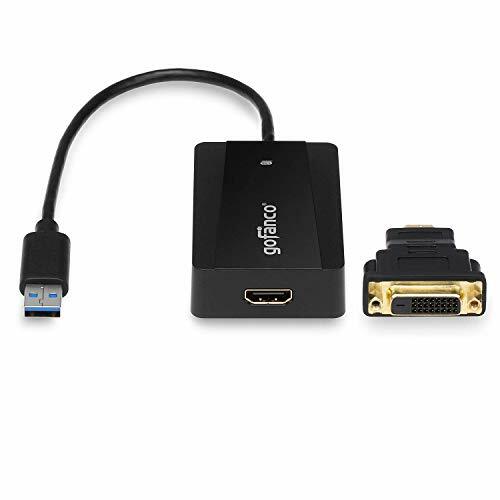 gofanco USB 3.0 to HDMI/DVI Video Adapter is designed to add an HDMI or DVI video graphics output to your USB 3.0 enabled Ultrabook, Microsoft Surface, Apple Macbook, laptop or desktop. It supports 1080p and up to 2560x1440@50Hz over HDMI and 2040x1152@60Hz when used with the included HDMI-to-DVI adapter. It supports HD resolutions and multiple display modes including primary, extended and mirrored. gofanco USB 3.0 to HDMI/DVI Video Adapter leverages SuperSpeed USB 3.0 bandwidth of 5.0 Gbps to deliver the best performance. The included HDMI-to-DVI adapter allows you to use our adapter with DVI monitors and is convenient to bring on the road for business travelers. ✔ SMOOTH EXPERIENCE WITH MINIMAL PERFORMANCE OVERHEAD: Built-in industrial leading USB docking chipset supports the highest mainstream desktop displays, providing an ultra low latency and highly interactive solution to connect multiple displays to any computing platform. ✔ EASY INSTALLATION & USER FRIENDLY DESIGN: User's guide and driver CD are included or available for download at gofanco website. Powered directly from USB bus with no power adapter required. 10 inches pigtail cable gives more flexibility to connect an HDTV, monitor, or projector to your USB-enabled devices; Green LED light indicates adapter is active and everything is connected. ✔ WIDE COMPATIBILITY: PC or Mac system with an available USB port (USB 3.0 recommended); Supports Windows 10 / 8.1 / 8 / 7 / Vista / XP and Mac OS X 10.6.x to 10.13.3 ONLY; 10.6/10.7 (video only). ** Note (4/2/18): Apple removed Video over USB support with the latest Mac OS 10.13.4 update. We recommend staying with Mac OS 10.13.3 or earlier until a solution is found. ✔ FIVE STAR CUSTOMER SUPPORT: FCC, CE & RoHS compliant. Our products are backed with a 1-year limited warranty and experienced tech support team in Silicon Valley. Contact us at "www.gofanco.com/contacts" if you have any questions or concerns.